PinkTaxiBlogger: Why All these Breakup Songs? When Gotye played for the first time on 92FM, it was love at first note. The languorous whining of the lead male singer, his complaints, his lyrics. I probably understood that "Somebody that I used to know" was a break up song from that first radio encounter. Then Gotye was played more and more frequently. On 92FM. And gradually the other radio stations caught on. Now, a pinktaxi stands the chance of singing along to its catchy tune at least 6 times a day, just by surfing the radio channels! I think the DJs play it because of its chirpy tune, its upbeat melody, its sound of revolt! 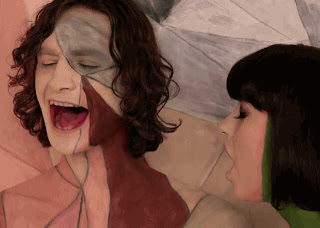 Ironically and thus a proof of talent, Gotye's sad, regretful lyrics and voice contrast sharply with the steady, rhythmic, almost crescendo music that accompanies his song. "Letting me believe it was always something that I had done..." replies the female with the stunning soprano voice on the same Gotye song. The song begins slowly with its most beautiful expression: "when we were together, when you said you were so happy you could die". Superlatives are splendid in break up songs. The album X and Y by my favored Cold Play is composed of break up songs too: Fix It, X and Y and What if. The guitar and the piano are such tear jerking instruments! And the lyrics are as close as it gets to Rimbaud poems. Chris Martin suggests a following scenario: a decision "that you don't want me there in your life". Yet his songs are not defeatist, they encourage risk taking and intrepidity: "Every step that you take can be you biggest mistake....that's the risk that you take". Depeche Mode have also sung their baudlairesque like sadness, have dwelt on the aftermath of breakup: torn up hearts and the policy of truth......when revelations lead to breakups, "when its too late to change events". On top of the break up songs is The Way you Lie by Eminem and Rihanna, a purely passionate scream. In this duet, Eminem raps: "when its bad, its awful!" In their case, they keep returning to each other because Eminem questions: "have you ever loved someone so much you can barely breath?" A friend remarked that "gray" is what sells nowadays. Take Kate Perry and her swooning over a guy that she could have had "in another life!" This is it for break up songs on the radio.....with an upbeat tone. I once smsed my favorite DJ: "Kate Perry's song can either make me feel very happy or very sad! Its one of those tilting songs!" I was not going to comment on this one because I never listen to 92FM,nor I get into this type of music.Yet I see that your regular music commentator has already done the job.